The Smart Tag of RadAutoCompleteBox lets you quickly access common tasks involved with and customizing the layout or setting the theme. MultiLine: You can easily enable the multi-line functionality with this check box. 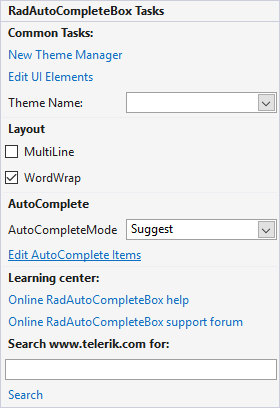 WordWrap: This check box allows you to enable the word wrap. AutoCompleteMode: Use this to select the desired auto-complete mode. Edit AutoComplete Items: this link opens the Collection Editor which allows you to add/remove items.